Once you decide to sell your home, you want the process to go quickly. But what do buyers want? Of course, it varies with the needs of each individual, but typically buyers are looking for a good neighborhood, a realistic price, a clean home, favorable mortgage terms and a timely move-in date. You can’t control all of these factors, but there are some things you can do to make your home sell faster. Start by realizing that you’re competing with other sellers, so your price must be competitive. If it’s not, potential buyers are likely to take their business elsewhere. You can also increase the perceived value of your home by adding a few welcoming touches and cleaning it up – both inside and out. Although you can’t do much to change your neighborhood, you can focus on the positive aspects of the area when speaking with potential buyers. Don’t be misleading, but try to put a positive spin on your comments whenever possible. Few buyers have cash on hand for the down payment and closing costs, so it’s wise to offer the best possible financing terms. With seller financing, you keep a mortgage for about 10 percent of the selling price instead of getting the cash from the buyer’s bank. Then, the buyers will pay you each month. But if you need the money from the sale of your existing home to buy a new one, seller financing may not be your best option. Some people will buy only if they can move in quickly, while others buy wanting to take possession at a later date. 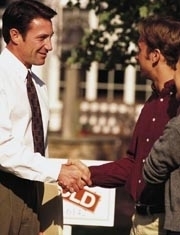 Either way, it usually pays to cooperate with the timing needs of a buyer whenever possible.